One of the more interesting flowers I have ever seen. Today's post definitely falls into the category of "looking but not seeing." I have walked, biked and/or driven past this bush literally thousands of times. I've even stood next to it and fished… But I never noticed it until this past weekend when I walked past with Henry. It is odd, because it really stands out. It's called the Button Bush, for obvious reasons. The flowers are something that you can't not notice. I have no idea why it took so long for me to clue in. 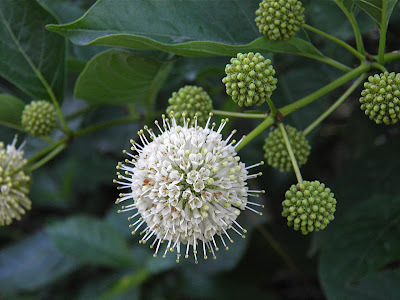 Button bush (Cephalanthus occidentals) is a flowering plant in the coffee family, Rubiaceae, believe it or not. Other names include Button Willow and Honey Bells. Button bush is a very attractive, old ornamental suited to wetter areas in the garden. It was often "rescued" from the wild by our ancestors and moved into homestead gardens, much as I am going to try. These bushes are loved by wildlife. The flowers are used by bees to produce honey, and ducks and other birds eat the seeds. Button bush likes to have wet feet. 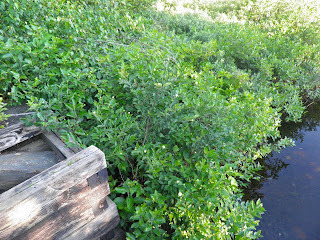 It likes to grow on river banks that often become flooded for part of the year. It can grow 5 feet high and 10 feet wide, at least in Nova Scotia. I have read smaller sizes but I was actually looking at the plant, so my sizing is indisputable. The flowers are unusual, to say the least. Blooming mid-summer in multiples on the end of new stalks, they are completely round, spiky and fragrant. See the photo above. The leaves are arranged in pairs on the stem. 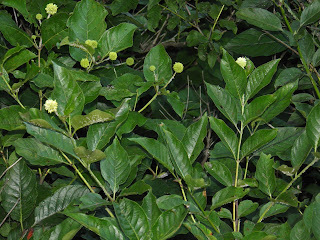 The leaves are glossy and pointed, and are quite attractive on their own. In fall the bush turns yellow, before the leaves drop off. In settlers times the bark was sometimes used in folk medicines. Current science casts doubt on its usefulness, because it contains a toxin. Some native tribes did use the bark as an emetic to induce vomiting. In high doses it can cause convulsions, paralysis and even death. So best not to use the bark, I would venture. Old fashioned plants are becoming more and more popular lately. Interestingly, they are often native. Button bush in particular attracts butterflies, birds and other wildlife and are easy to grow. 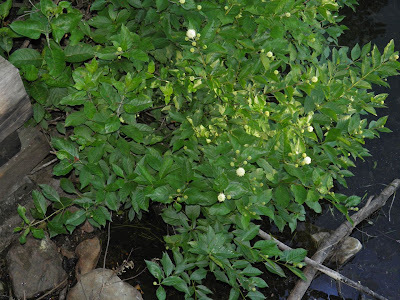 Because of its tolerance of wet It can be used in areas of a yard where other plants would die. They can help control erosion on river banks and give habitat to wildlife and food to butterflies and birds. There was a part of this growing close-by in a much drier spot. That's where I'm going digging. If you're like me, and you find one in the wild, you'll start looking around the base for stems that can be dug up. I know have my eye on a few where I found this bush.